Story Contracting are proud to announce that they will be raising funds for their Charity Partnership 16/17, the Great North Air Ambulance Service (GNNAS). The chosen charity was voted for by staff and will be supported throughout the year. 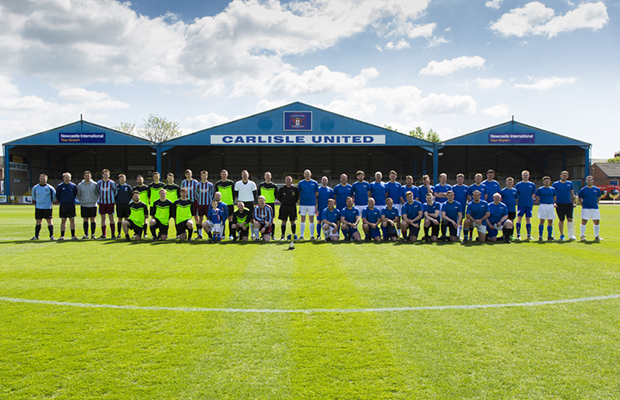 Fundraising kicked off last weekend with an ‘Old Firm Derby’ between Story Contracting and Story Homes at Carlisle United football grounds, Brunton Park. £1000 was raised for Great North Air Ambulance as the two Story companies battled it out for the Story Cup. Colleagues will be encouraged to undertake a wide range of fundraising activities over the next 12 months and have many plans already in the pipeline including Gelt Gladiator, a Story Ryder Cup and lots of cake-eating. The Great North Air Ambulance Service operates 3 helicopters, 365 days a year, across the North-East, North Yorkshire and Cumbria, responding to around 1,000 call outs each year. On board their aircraft are specialist trauma doctors and paramedics, who bring accident and emergency expertise to the scene. Whether it’s in a city centre or a remote mountain, medics respond to wherever they are needed in the shortest space of time. The helicopters are never more than a 15-minute flight from the nearest hospital.